September 29, 2016 What is Data Warehouse? In computing, a data warehouse (DW or DWH) is a database used for reporting and analysis. The data stored in the warehouse are uploaded from the operational systems (such as marketing, sales etc., shown in the figure to the right). The data may pass through an operational data store for additional operations before they are used in the DW for reporting. 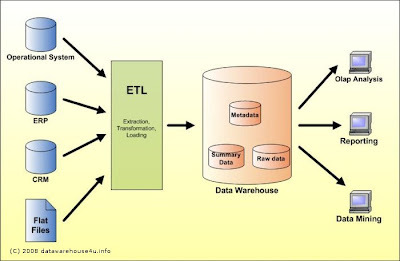 The typical ETL-based data warehouse uses staging, integration, and access layers to house its key functions. The staging layer or staging database stores raw data extracted from each of the disparate source data systems. The integration layer integrates the disparate data sets by transforming the data from the staging layer often storing this transformed data in an operational data store (ODS) database. The integrated data is then moved to yet another database, often called the data warehouse database, where the data is arranged into hierarchical groups often called dimensions and into facts and aggregate facts. The combination of facts and dimensions is sometimes called a star schema. The access layer helps users retrieve data. A data warehouse constructed from integrated data source systems does not require ETL, staging databases, or operational data store databases. The integrated data source systems may be considered to be a part of a distributed operational data store layer. Data federation methods or data virtualization methods may be used to access the distributed integrated source data systems to consolidate and aggregate data directly into the data warehouse database tables. Unlike the ETL-based data warehouse, the integrated source data systems and the data warehouse are all integrated since there is no transformation of dimensional or reference data. This integrated data warehouse architecture supports the drill down from the aggregate data of the data warehouse to the transactional data of the integrated source data systems. Data warehouses can be subdivided into data marts. Data marts store subsets of data from a warehouse. 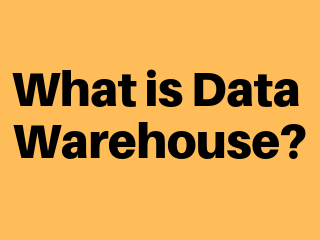 This definition of the data warehouse focuses on data storage. The main source of the data is cleaned, transformed, cataloged and made available for use by managers and other business professionals for data mining, online analytical processing, market research and decision support (Marakas & O'Brien 2009). However, the means to retrieve and analyze data, to extract, transform and load data, and to manage the data dictionary are also considered essential components of a data warehousing system. Many references to data warehousing use this broader context. Thus, an expanded definition for data warehousing includes business intelligence tools, tools to extract, transform and load data into the repository, and tools to manage and retrieve metadata.